During our work on exposures in the United States we have seen it reported that EMV has significantly reduced fraud in the United Kingdom. That was true for some years, but in less in recent years and the trend isn’t good for consumer security. For several years Financial Fraud Action UK has published a fact book, the most recent is Year-end 2015 fraud update: Payment Cards, remote banking and cheque covering activity through 12/31/2015. Total payment card fraud, measured in millions of British Pounds Sterling (BPS) is up significantly in absolute terms and relative to the previous year. 2015 is the fourth straight year of absolute increase. Over the same years total payment card fraud relative to sales has risen every year from 0.062% to 0.0998%. As a percent of total fraud: from 2007 to 2015 e-Commerce rose from just over 33% of total charge card fraud to just over 46%. As a percent of sales: e-Commerce fraud dropped to a low of 0.0280% in 2012 and rose to 0.0460% in 2015. That isn’t the whole picture. The FFA-UK includes e-Commerce within a larger category called Remote Purchase (CNP). “CNP” stands for “card not present”. Remote Purchase includes the use of card details (not necessarily the card itself) which were improperly obtained via compromises of merchant data repositories, skimmers, POS malware, phishing, and similar methods. What in the US might be collectively called “e-Commerce”, is more properly reflected in the broader UK category of “Remote Purchase”. 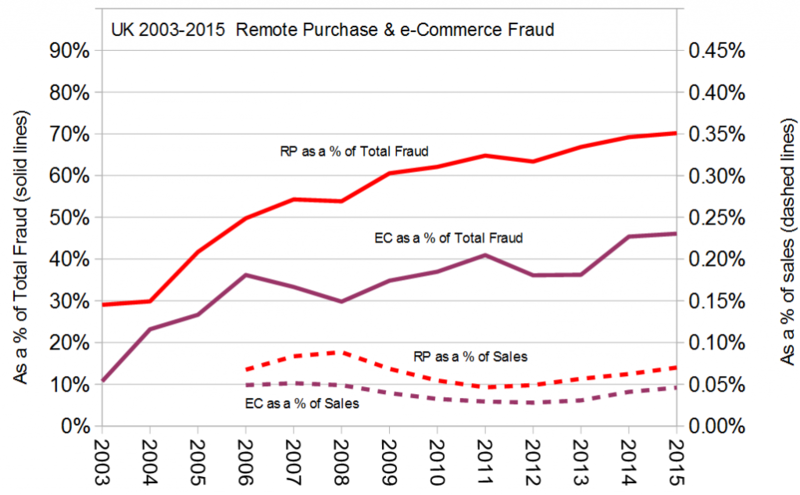 As a percent of total fraud Remote Purchase (RP) has risen from just under 30% in 2003 to oover 54% by 2007, and just over 70% of all charge card fraud as of 2015. As a percent of sales RP peaked at 0.088% in 2008, dropped to a low of 0.046% in 2011, and rose to 0.070% in 2015 and the trend is up for the past four years. EMV (along with major public awareness efforts) had a significant impact reducing card-present fraud, but the impact on total fraud continues to diminish. The impact on Remote Purchase (CNP) is doubtful. During 2003 to 2015 RP fraud grew as a percent of total fraud from 30% to 70% and RP climbing as a percent of sales for the most recent four years. Annual charge card sales sales information from the UK Cards Association and select the December 2015 report, see all sectors, the total from the 12 months of 2015. Non-clickable links shown in square brackets were active at the time the page was prepared but are no longer active.